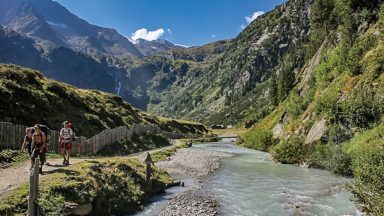 Guidebook to trekking the Zillertal Rucksack Route (or Berliner Hoehen Weg) and the Zillertal South Tyrol Tour in the Austrian Tyrol. 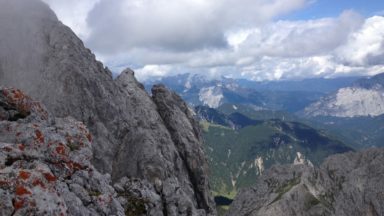 The ZRR avoids glaciers and difficult passes so is suitable for inexperienced trekkers, while the ZSTT traverses the range along the Austro-Italian border. Each takes 8-10 days and has excellent Alpine huts on route. Few areas can match the Zillertal, in the Austrian Tyrol, for a first Alpine season. Shapely peaks, good paths and some of the best huts in the Alps make it ideal for experienced trekkers and mountaineers alike. 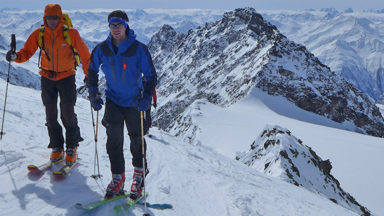 This guide describes two popular hut-to-hut routes, both of which can be accomplished in eight to ten days, with the option to add in day excursions from the huts to climb local peaks on both sides of the border, including the Zillertal’s highest summit, the Hochfeiler. The Zillertal Rucksack Route, or Berliner Hoehen Weg, links eight huts without crossing glaciers or difficult passes, with ample opportunity for scaling nearby peaks. It starts above Mayrhofen and follows a circular route ending high above the charming village of Ginzling. The length of this tour is 70-80km, depending on your exact start and finish points, and ascends some 6700m. As the name suggests, the Rucksack Route can be traversed entirely without crossing glaciers and without specialist climbing skills. However, it does involve negotiating steep ground, crossing late summer snow and making use of fixed wire rope here and there that are installed to aid stability. The Zillertal South Tyrol Tour traverses the whole range along the Austro-Italian border, starting at Turistenraste then linking back to the Rucksack Route to make a circular tour. It is virtually unknown outside the South Tyrol, which helps make it into an interesting and unusual route choice. Overall it is about 55km long and ascends just over 5000m (not including any additional peaks.) 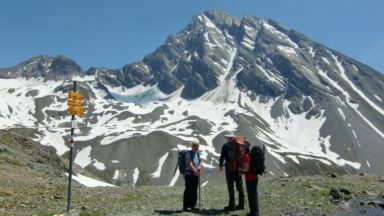 It is a physically demanding trek, providing an excellent challenge to more experienced alpine walkers who wish to undertake a tour that is remote and challenging. Both routes are illustrated with sketch maps and profiles. Glossary, hut directory, alpine walking tips and lots of other practical information included. Easy access to the routes from Mayrhofen. The following maps are required for both tours in this guide. The maps are published by the Austrian Alpine Club and available from the UK Section of the Austrian Alpine Club (www.aacuk.org.uk). 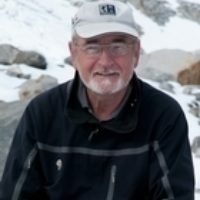 Due to previous posts in 2013, the route continues to deteriorate due to a lack of traffic and further deterioration of the Stilluppkees glacier. The traverse of the mountain as shown on the photograph on page 66 is no longer possible. 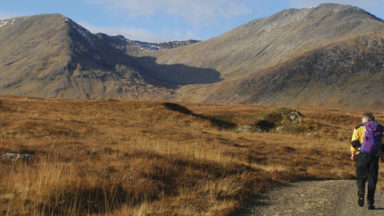 The normal way via the Stangenjoch should be followed by making a rising traverse over very difficult ground of boulders and loose rubble to access the glacier. Due to further retreat of the glacier the climb/route is becoming increasingly problematic. Enquire at the Greizer Hut. Due to further retreat of the glacier, access onto the Floitenkees glacier is becoming very difficult. Access is only possible at the point of the letter N of the word Floitenkees on the AV map via a steep sliver of ice. Enquire at the Greizer Hut. The summit snow arête has now almost disappeared making the ascent very straight forward over rock. Para 1, new wires have been installed, however access onto the Glider Ferner glacier remains problematic. The Gesprutt sign mentioned on page 148 has now been removed and the path is open aided by a new bridge over the menacing ravine. Both routes are still possible but are becoming increasingly problematic due to glacial retreat. For the Greizer Hut the only way off the glacier is at point N on the AV map as mention above. gap/col is incorrect and should go to the right hand gap/col. With the advances in mobile technology it seems most folk are reserving beds. Best to make a reservation particularly at weekends. The traverse of the mountain via the Wollbachjoch is not recommended due to a general retreat of the glacier and a rockfall near the col making access very difficult. Gunther Knapp has left the hut. Contact details remain the same. If you would like to send us a review then please use our contact form. They will be published here shortly. 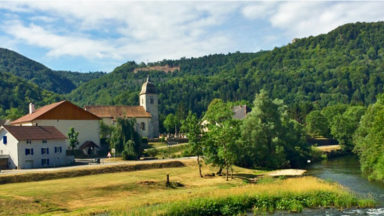 Allan Hartley has maintained his close links with Austria, which he discovered by accident in the early seventies in respite from atrocious weather conditions on the higher mountains of the western Alps. He has climbed extensively throughout the Alps, in east Africa and in the greater ranges in Nepal and Pakistan. Get 50% off the new book if you've got an old edition of a Cicerone guidebook. If you're not happy with your purchase for any reason, we'll give you a full refund.